What does the plugin do for me? 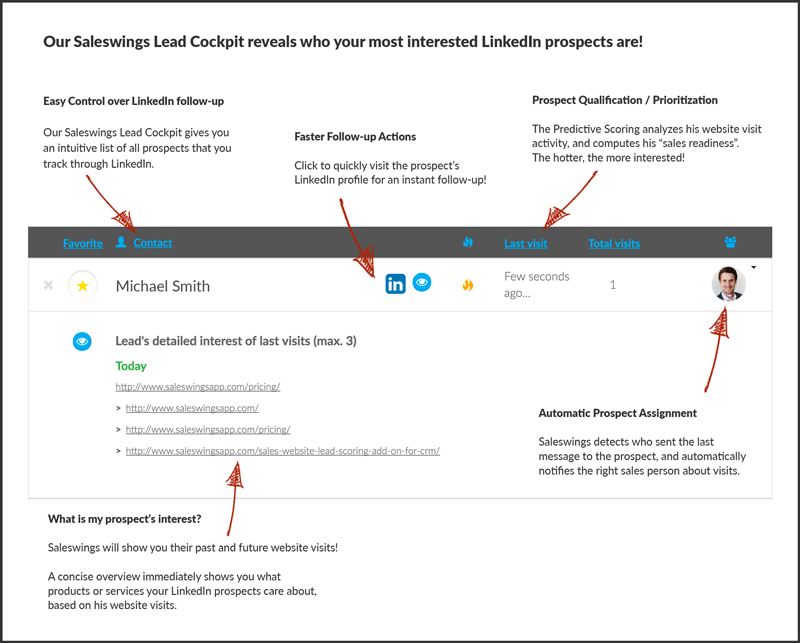 When you send an Inmail or a LinkedIn message to a prospect, our "Saleswings for LinkedIn" extension will automatically add tracking to all links which point at your website in your message, to understand what prospects you need to follow up with. Who should I follow up with first? What products / services is he interested in on your website? How many times has he visited your website? How strong is his interest (predictive score based on what he does on your website over time)? Send messages and InMails to your prospects, and make sure to include links to your website! Before sending messages and Inmails, make sure to reload the LinkedIn window! Today, our "Saleswings for LinkedIn" extension only works on the "normal" LinkedIn screen with normal messages and Inmails. Why does our plugin matter: Social Prospecting is simply Key. Social Selling, and Social Prospecting on LinkedIn, is a key discipline of modern sales and business development managers, recruiters, and entrepreneurs. Our brand-new, exclusive "Saleswings for LinkedIn" add-on will finally allow you to prioritize your LinkedIn follow-ups by tracking your leads through LinkedIn Inmails and messages. If you have further questions, please send us a message to support@saleswingsapp.com. (Aaaarrrghh... we had to discontinue the LinkedIn tracking feature, as per request from LinkedIn.